This gorgeous vanity set is made of sienna celluloid, delicately embellished with silver detailing. 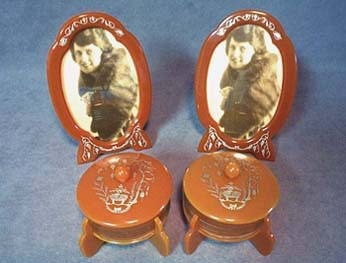 The set includes two shapely 7" x 4-5/8" picture frames (for 6" x 4" photos) and two covered dresser boxes. The frames are fitted with peach velvet backings which totally enclose the back sides, including the frame rests. The round glass dresser boxes are encircled with three black lines, and sit atop a celluloid disk that creates a bottom for the stylish base. The matching celluloid cover has a round ball knob on top, and one lid has a small chip in the underside rim that fits inside the box. Each piece is marked "DuPont Cathay U.S.A." This beautiful vanity ensemble is incredibly clean and in near mint condition.